Every year, a new version of Android is released, and every year, lots of improvements are made. That's a given, but sometimes useful features fall by the wayside as well. In Android 8.0 Oreo, you can easily see a list of the apps for which you have blocked notifications. In Android 9 Pie, that list has vanished. This was brought to our attention by Android Police alum Ron Amadeo on Twitter, as so many interesting software oddities often are. In Oreo, there's a drop-down in the App notifications screen with options for 'All apps' or 'Apps: Turned off.' 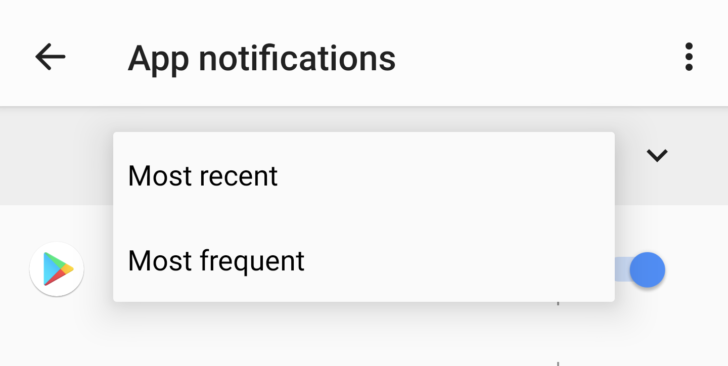 In Pie, these have been replaced by sorting options 'Most recent' and 'Most frequent,' with no way to easily see which apps have notifications turned off without entering the individual settings for every single app. What a fun way to spend an afternoon. Android 9 regression: No way to view apps with blocked notifications. Thankfully, Google is aware of this omission and has already prepared a correction. According to this bug report, the issue "has been fixed and will be available in a future build." With any luck, Android 9.1 will restore the settings to the way things were so we can efficiently investigate problems with notifications again. This is especially important since Pie's "You usually dismiss these notifications. Keep showing them?" prompts have made it infinitely more likely that'll you'll accidentally turn off alerts for an app.